A fair warning: this review is going to feature a LOT of gushing over Dwayne Johnson more than anything about Central Intelligence itself. That’s because the former professional wrestler, best known as The Rock, has successfully built a reputation as not only one of the new leading action stars in the same vein as Stallone and Schwarzenegger back in the day, but one of the most charismatic and downright entertaining actors of the past decade and a half, injecting life into dumb-but-fun movies like The Scorpion King, Hercules and the Fast & Furious sequels, and even being the best thing in terrible movies like Pain & Gain, San Andreas and G.I. Joe: Retaliation. Everything he is cast in immediately becomes more watchable because he is one of those rare actors who can do action, comedy, drama, you name it, almost flawlessly once you put a camera on him. Make no mistake: Dwayne Johnson is the very definition of a movie star. 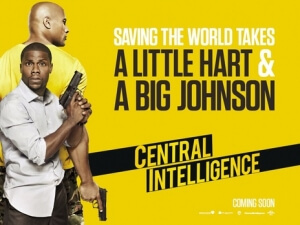 As for Central Intelligence, in which he plays a formerly overweight social outcast in high school who is now a lethal CIA agent on a dangerous mission with reluctant sidekick Kevin Hart, he once again steals the entire show in an all-out (and sometimes balls-out) comedic performance that he just puts so much energy into that it’s hard not to love him in this, even at times when his character threatens to become just a little too grating. It’s honestly such a pitch-perfect performance for a film that itself is just fine – nothing special, but nothing horrible either – that you have to admire the fact that at this stage, you could cast Dwayne Johnson as the back end of a horse costume in a pre-school nativity play, and he would still find a way to make it work in everyone’s favour. He’s so enjoyable here, that even an established comedian like Kevin Hart struggles to keep up with his co-star. Hart does fine as the audience surrogate character of Calvin, the former popular kid with everything promised before him but now leading a non-exciting life as an accountant, and when the film allows him to be the straight man to Johnson’s hulking and heavily-built oddball Bob, with whom he shares a fun chemistry, he’s completely serviceable. However, once the action gets underway, he resorts to that Chris Tucker method of action wherein he comically screams with a high pitch that could make dogs roll over in pain, and it can be a little too annoying to bear. It’s not enough to ruin the film or anything, but it is perhaps not the best way to use your Kevin Hart in a movie either. The film itself, like we said, is perfectly fine for a rainy day or a night in with your mates; it’s the same type of spy-centric buddy-comedy that’s been done time and time again, with Johnson going on the run after being falsely accused of selling launch codes to terrorists and all that familiar stuff, and though it suffers from predictable writing (the moment you see a certain actor on-screen for a supposedly small part, you instantly identify them as the big bad several scenes before the big reveal), the execution by director Rawson Marshall Thurber is lively and relatively straight-forward, and is certainly a funnier step-up from his previous film We’re The Millers. A few other names show up for smaller roles and cameos, including Jason Bateman who is essentially doing a comedic rendition of his character from last year’s horror hit The Gift, and though not many of them are given as much material to work off of as Johnson and Hart do, they are not given so little for their work to be entirely pointless at the same time. For what it is, Central Intelligence is completely fine for what it is. You may see a lot of the twists and turns coming a mile away, but if you don’t care about any of that and just want to see Dwayne Johnson and Kevin Hart acting off one another with various quips and their differing comedic personalities, then you’ll get exactly what you paid for. Especially if you want to see Dwayne Johnson be so damn awesome in anything he does, which – let’s face it – is all you really want to see anyway. Central Intelligence is a standard but serviceable action-comedy that’s entertaining enough for a night in, but it’s brought to life even more through the sheer strength of Dwayne Johnson’s eternal on-screen appeal and his pairing with the fine, if a little grating at times, Kevin Hart, though Johnson is undoubtedly the scene-stealer in every frame he’s in.